Power bank do you know? and how does it work ? Do you have this experiences: when you go to the shop to buy a mobile phone, the sales workers normally will tell you if you buy this brand mobile phone, you will get a free power bank and other free accessories. With the development of science and technology, there are more and more intelligent electronic products. In life, more and more people are inseparable from mobile power bank. Portable Mobile power banks are more and more popular in the market and become necessary accessories for people, but do you really understand powerbank, do you know how does it actually work? Put simply, Power Banks are comprised of a battery in a case with a special circuit to control power flow, It allows you to store the power so you can charge your devices when you need it. Gradually become an essential accessory for people. You will find it has different shapes, different sizes and different capacities. Does this cause you to be confused about which one to choose? If you want to know which one is right for you, please click here. 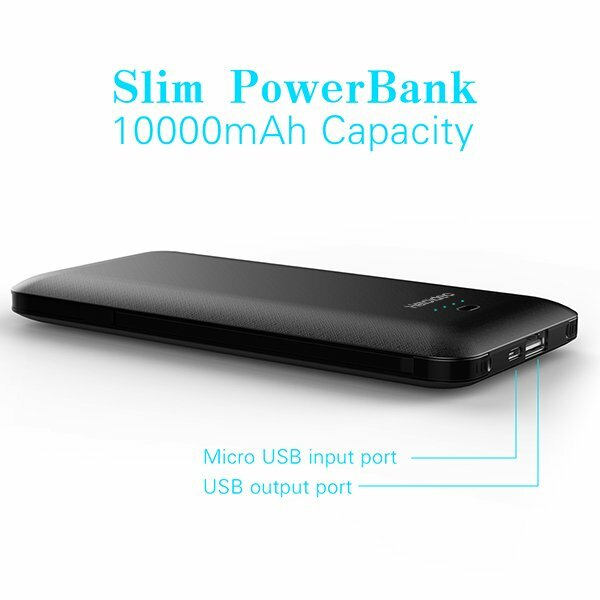 If you search the powerbank, for example, Power bank 10000mah in market, you will find that it has a different shape, different size. This is because of different factory use the battery type is different (if the battery capacity is 100% full capacity). Usually, the polymer battery size can adjust based on your product design, of course, the battery size is more larger, the battery capacity is more bigger. But the round shape battery type, we called Li-ion battery or 18650 battery, each capacity both have the same size even it is 2200mah or 3350mah capacity. So if you bought a so slim mini power bank with high capacity such as 20000mah with very cheap power bank price, maybe you got a false power bank. INPUT, it’s mean that recharge the portable power bank, so how to recharge the power bank charger? In the past years, people will only recharge the power bank Through the Mini or micro USB port from USB port in Computer or USB wall charger, most of phone power bank have a micro usb input port and USB A output to charge your smartphone, camera, MP4 etc. Currently, with the development of technology and the maturity of, such as Type C Two-way input &output by a same port. 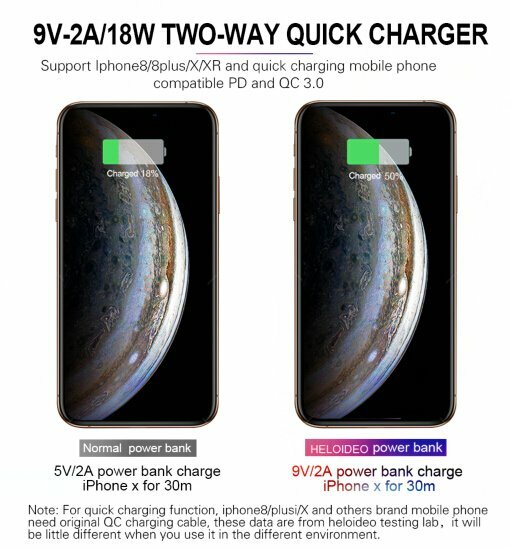 USB-C PD is now preferred and recommended charging standard for both Apple’s new and upcoming iPhones and the future Android phones and it is safe to assume that buying a USB-C PD powerbank is a future-proof investment.so many power bank factory or supplier will design and producing many new USB C power bank in future. If you want to know more about the fast charging PD power bank, please click here. That’s mean charge your mobile phone or other digital devices such as iPad through your best power bank, the output current of power bank charger normally is 2.4A or 2.1A & 1A, some few items have 5V 3A output for a quick charge. Usually, one power bank has these output current same time to make it easy to use and charge different devices at same time. The specific output charging current that the mobile power supply can provide depends on the device being charged. For example, the iPhone 6 can accept 2.1A input current, if you use the 2.1A USB output of the power banks can charge faster than 1A output port. from 0%~ 100%, the charging time will be shorter. 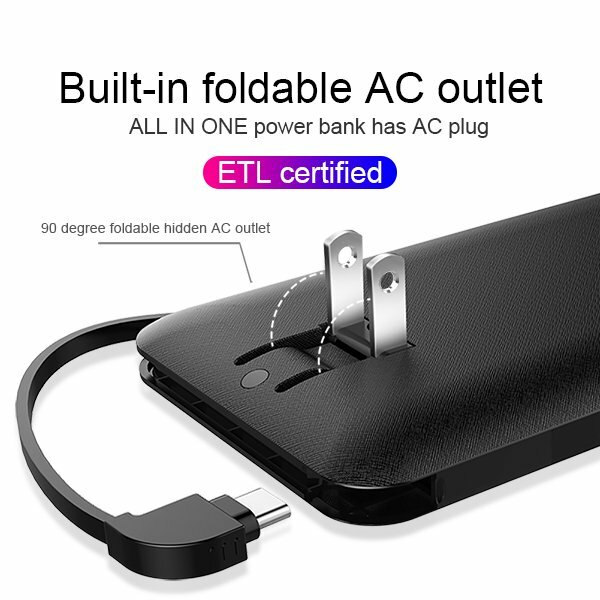 When there are multiple outputs on a power bank, it is common to find 2.4A, 2.1A, and 1A outputs together. With simultaneous charging across all three of those ports, all devices, no matter their charging amplitude, can power up. Do you have such confusion? The battery capacity written on the mobile phone power bank is 10000mah, but why do you need to recharge it after using several times? Example, iPhone 6 battery capacity is 1810mah, so it can charge 7 times from 10000mah ? in fact, it can charge 5-6 full times. Here you need to consider the efficiency issue: Although the mobile power pack is marked 10000mah, the power will not 100% converted to electricity to your device. This is due to the working environment, battery quality, etc., which will cause power loss. When power is transferred, there is always loss due to resistance. Power Banks are not able to transfer 100% of their actual capacity to a device, so we factor in this loss when calculating how many times an average device can be charged from a fully powered Power Bank of any given size. Efficiency ratings differ between Power Banks based on their cell type, component quality and environment. Ratings between 80% and 90% are the current industry standard. Beware of suspiciously low-cost options claiming high-efficiency ratings. Built-in charging cable: some power banks not only built-in AC Plug but also built-in charging cable, so you can charge your smartphone from this cable directly. And no need extra charging cable in the bag. 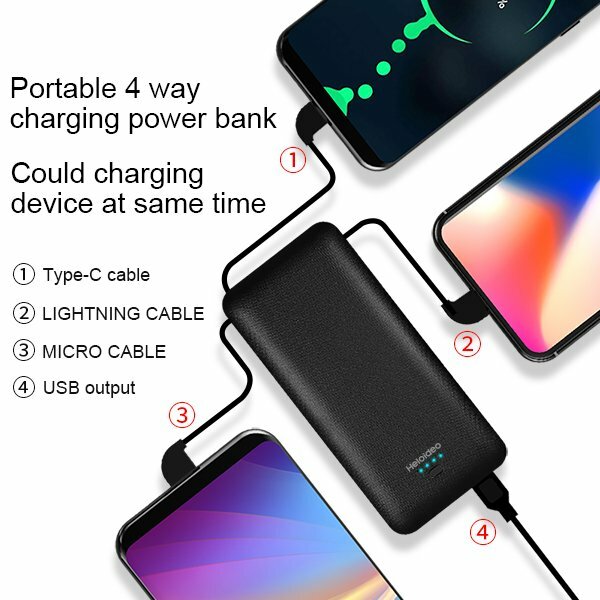 currently the most popular power banks with 3 charging cables for iPhone, Android, and Type C devices. So you can get one power banks, can charge different smartphone same time or for family use. Do you want to know more details about this kind of portable power bank, please click here. Car Charger Power bank, Some people may ask, most of the mobile power supply is used outdoors, but what if the battery bank for mobile is out of power during driving? Do not worry, here is a product suitable for you: combining the function of car charger and smart powerbank, you can charge the phone power charger and your mobile phone in the car same time. after parking, you can still carry it around and charge your mobile phone anytime and anywhere. currently, Do you want to know more details, Please click here.